Companies of all sized know the importance of an online presence. However, with the multitude of sales strategies for web developers, it can be difficult to find out which direction your online business needs to be going. 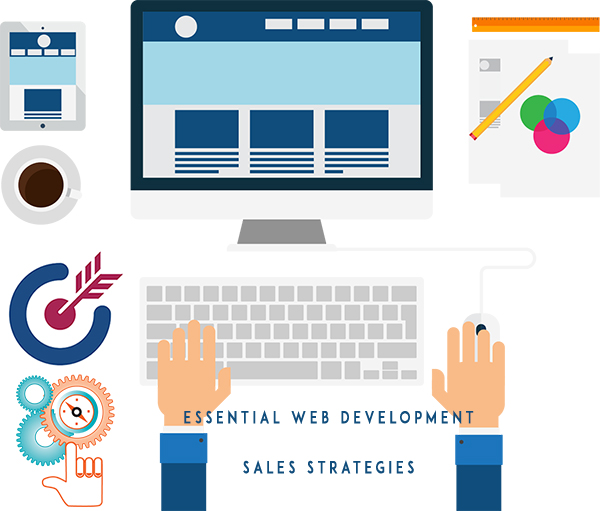 Here we’ve laid out the essential web development sales strategies whether you’re a brick and mortar business trying to gain traction and attention online, or you run an e-commerce store or other solely online profiting company. If you don't have past online data for your business yet, then see what you can dig up on other companies that are in a similar niche or share the same goals as you. Past data is critical when designing a sales strategy because it will give you information about campaigns you've run and how your customers reacted to them. In your research, you may find that visitors stay on product pages longer and convert more when you use 360 images. Little details like this can go a long way for your ROI. You should always be looking for gaps in your online business, as well as your competitions. Your job is to fill this void with something useful for customers. In some cases, you'll find that this gap has been costing you sales and should have been part of the original plan (doh!). Perhaps your company just hasn’t had the time or resources to fill it yet, or it’s simply been an oversight. Other times, you'll find a gap in your web development sales strategy that will fill a consumer need that hasn't been identified before. Here you'll have a significant opportunity to increase conversions because you'll be doing something unique and helpful to the customer that no one else is doing. Your web development sales strategy should be narrowed down to the task with a particular time frame in mind. Not only will this help you measure success for a given period, but it will ensure that you don't lose money because you are sinking it in months of work rather than a few weeks. If you haven't set a budget for your sales strategy yet, it's time to get out the calculator. To have an understanding of what you're getting out of your web development sales strategy, you have to know what you're putting in. And don't just count the money, factor in the man-hours and a number of people you have on the job. By keeping your budget in mind through the sales process, you'll know what you can expect in reality, and you can set attainable goals. This way, if you have crème Brulee taste and a Jell-o budget, you'll know beforehand and can adjust your vision accordingly instead of being disappointed because the money you put in didn’t pan out. Gather intelligence from your top competitors because they've been getting busy selling products and services on their website too. You want to assess how their site looks compared to yours and how strong their online presence is via social media. You should also find any press releases or mentions in the news they've had to see what direction they're taking. While you don't want to mimic their efforts, you do want to be aware of them and make sure that you’re staying competitive and cutting edge. Throughout the duration of your web development career, you'll want to monitor progress continually and change the sales plan according to the results. It's a common misconception by many people who design a website – they think it's a one-time setup, and that it will run itself like a well-oiled machine. Hate to be the bearer of bad news – but a website is an extension of your business, and your bottom dollar is a reflection of how successful it is. And this means you never stop designing, developing, and adapting your sales strategy as customers habits and the market changes.